Recognising that today’s customers are always looking for quick, simple and convenient solutions, DuPont has launched its new Online Nomex® Garment Catalogue – a dedicated site that showcases a complete range of garments containing Nomex®. All garments featured have been inspected by DuPont and are made using fabrics certified according to its stringent requirements that exceed EN norms. The garment manufacturers featured here all belong to the DuPont™ Nomex® Partner Program. With over 25 partner manufacturers located across Europe, viewing the extensive range of garments using Nomex® in one place was not straight forward. By creating the Online Nomex® Garment Catalogue, DuPont has refined and simplified this process; enabling users to find Nomex® solutions, all from partner manufacturers, in one place. The Online Nomex® Garment Catalogue offers customers an easy way to see all the garments approved by DuPont and supplied through the Nomex® Partner chain, with all the related benefits of buying from a partner. The DuPont catalogue is also directly linked with Partner manufacturers’ websites, so that if customers wish to purchase an item, they can do so quickly and efficiently. 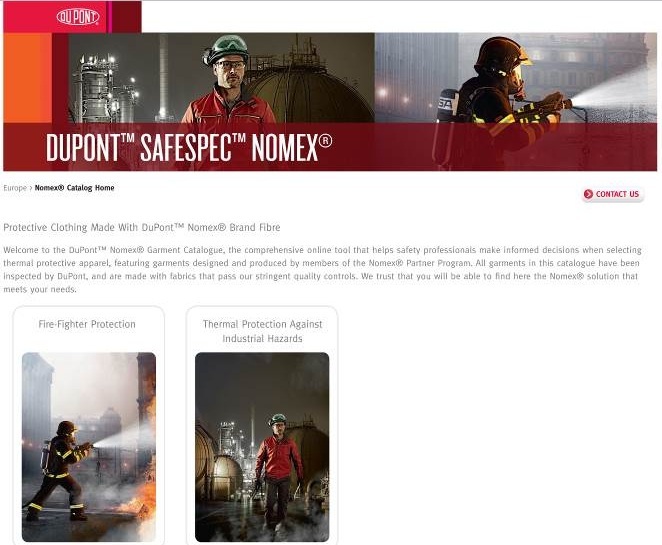 The interactive catalogue, part of the DuPont™ SafeSpec™ Nomex® product selector tool, separates its products into two clearly defined customer markets: the firefighter and industrial worker. Products can then be filtered by manufacturer, garment type and norm, allowing customers to easily locate products that meet their exact requirements. The filters can also be combined, ideal for when you are looking for multi-function garments such as heat and flame protection. As this online resource develops, further customer markets will be added. With video links, information on EN standards and additional testing passed like Thermo-Man® or Arc-Man®, the Online Nomex® Garment Catalogue provides users with a quick overview of their chosen product. On the same web page, the catalogue also recommends similar or matching products, so that customers can clearly see garments which work together to provide additional protection. For more than 40 years, people have trusted in Nomex® products to offer them one of the best thermal protection on the market. With the introduction of the new Online Nomex® Garment Catalogue, product selection has never been more straightforward. To find all your Nomex® solutions in one place, please visit www.safespec.nomex.co.uk.